SpitFire is a new theme by Rhombus Productions. It is a clean theme perfect for any type of site. 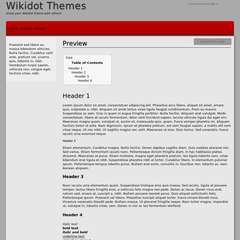 I have a few themes that I created years ago for Wikidot - but for the most part they're crap :) Maybe I should "release" them anyway, so that others can improve them. also, im trying to decided if i should make different version in different colors, like blue or green. Hi am trying to make a school website for my school club however it wont show the sidebar even though I just copied and pasted the same code on this page. I have it as a custom theme with both navbars checked for use. I have the same problem for some of my other sites as well. Not to mention every couple of days my site looks like the blank theme. Is there something that I am missing in the Site CSS or is it a bug?